For 6th-12th grade Young Men and their Families. Presented by Green Run High School's G.M.A.C. We are once again offering an opportunity to congratulate honorees in our Scholars Breakfast commemorative program book. 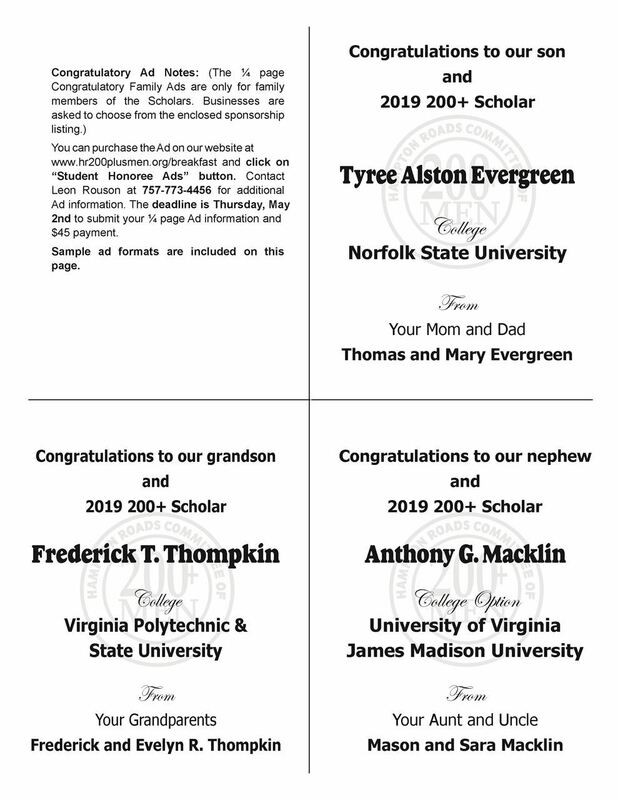 You can purchase a congratulatory ¼ page ad for your son’s accomplishments for $45. A nice way to say "a job well done!" Click on the Ad Form below to see details and sample Ad formats. no later than noon, May 2, 2019. View sample Ads options here. Hampton Roads Committee of 200+ Men, Inc.
To submit credit/debit card payment online, please click on the "registration" button to the left. You will be linked to our secure PayPal site. If you have questions or need additional information, call 757-773-4456 or e-mail Leon Rouson. Our 22nd Annual 200+ Scholars Breakfast is the culminating event showcasing the best and brightest young African-American male high school students in Hampton Roads. To ensure Ad copy accuracy, please note that the name of our organization is The Hampton Roads Committee of 200+ Men Inc. The name of the event is the 22nd Annual 200+ Scholars Breakfast and our honorees are referred to as 200+ Scholars. Ad copy, in B/W or Grayscale, must be received no later than COB May 2, 2019. The format for camera-ready Ad copy is Adobe Illustrator, CorelDRAW, JPEG or TIFF. E-mail Ad copy to 200plusmen@cox.net. If you have questions or need additional information, call 757-455-9260 or e-mail 200plusmen@cox.net. Student registration is for 200+ Scholars Breakfast honorees that have received an invitation from 200 Men Inc. There is no charge for the honorees to attend.